Stortfordians Connect is the official website and smartphone alumni platform for our worldwide network of Old Stortfordians. For young OS, Stortfordians Connect allows you to directly contact experienced professionals amongst the OS network for careers advice and guidance. For OS who are mid-career, it gives you the chance to advance your career by improving your business network and, if you wish to do so, offer career mentoring support to young OS. Stortfordians Connect gives you privileged access to an exclusive global community of OS professionals, working across industry sectors. You can use it to promote yourself, your business, get a new job and get new clients. Some OS will remember the days when the OS Directory was sent by post to all OS who paid a subscription. Sadly, modern day data protection legislation makes producing such a directory impossible. 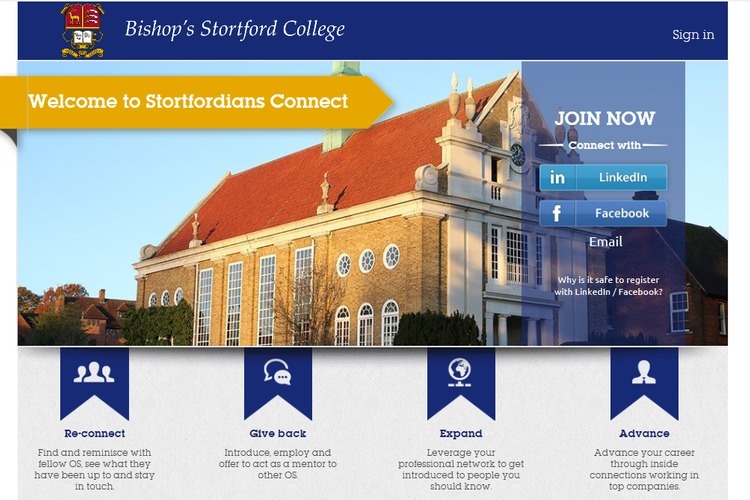 In its place, the College is providing you with Stortfordians Connect free from subscription and you will be able to contact other OS who have registered directly. Stortfordians Connect is not, however, all about business and getting ahead at work. It gives you the chance to find old school friends, reminisce, see what they have been up to, share memories, photographs and stay in touch. It also allows you to get connected with OS who share similar sporting, cultural and other social interests. In addition, Stortfordians Connect provides one calendar for all OS events and you will be able to see who is coming to an OS event near you. It is also available as an Android and Apple App. In the Android market place, you will need to search for 'Stortfordians Connect'. In the Apple Apps store, you will need to search for 'Graduway' and after downloading the App, enter the access code 1409463. You can sign up in less than a minute by using your email address or by importing your Linkedin or Facebook profile. Our Old Stortfordian Society professional networking group on LinkedIn continues to grow in size and is an invaluable resource for Old Stortfordians. This is a closed group so you can be confident that all members are genuine Old Stortfordians. Join our LinkedIn group to make valuable contacts and keep up to date with forthcoming events. The more active the membership of the group, the more effective it will become in building a professional Old Stortfordian networking community. In 2011, Old Stortfordian Alex Watson (Grimwade House & School House 1989-1998) created the ‘OS Access Business Internship’ at Australian Business (Australian Chambers of Commerce in the UK). Alex approached the College’s Higher Education & Careers Department and offered a six week summer internship to a current College pupil. The approach to the College was initiated by Alex and pupils were selected on the basis of CV’s and interview. The internship gave the successful applicant, Alex Hunt, the opportunity to be involved with ongoing projects and to take ownership of a small event on behalf of the organisation. Alex Watson has committed to make the internship an annual occurrence and we are sure that demand amongst current College pupils to secure the place will be high in coming years. The OS Access Business internship is an excellent example of the way in which an individual OS can enhance the career prospects of an enthusiastic College pupil just on the brink of entering professional life. It really can be a win-win experience for all involved: the pupil gains real insight into a professional environment and the organiser of the internship gains the enthusiasm and desire to learn from the pupil. Alex Watson has very kindly agreed to share his experience of setting up and delivering his internship with any OS who may be considering offering a similar opportunity to a current College pupil. Please use the web form above to contact the OS Office and we will pass on Alex’s contact details.